During the years my wife Anne and I spent our winters in Florida, we made a number of friends, and with some of these we remain in close touch. In Florida, folks take their politics seriously and with only a few exceptions, most of our friends are staunch Republicans. Being a middle of the road Conservative myself, we would have some rather interesting discussions from time to time, especially if there was a little liquid medication involved! I am not sure my friends are of the Tea Party type, but the reality is that many Conservatives in the United States are moving farther to the right as they react to what some see as a radical movement to the left under the Obama administration. And so it is with some trepidation that I write about my views on Donald Trump and his bid to be President of the United States. They might well tell me to mind my own damn business! But then, they know me better than that! Years ago, I knew Donald Trump. He was actually a client of our Firm when he was seeking to do business in Canada. He was bright, he was aggressive and he had an ego that surpassed anything I have ever seen. At the time, there was much about him I liked. But I also saw a bit of the bully in him and observed that he was not a good listener. I also thought he was an astute businessman but not well read on broader public issues. Hard to believe, but he was also a Democrat! And now I watch as Donald Trump seeks to become President of the United States and I am shocked and deeply concerned. It is hard to tell if his alarming rhetoric is simply strategic or if he actually believes it. But either way, some Americans are eating it up and fairly or unfairly, it exposes the underbelly of extreme right wing Conservatives. While some will see it as an overstatement, there is much about Trump’s election campaign that reminds me of events preceding the Second World War. Hitler’s rise to power followed a platform of making Germany great again. Trump’s Slogan is ‘Make America Great Again’. Hitler was a racist. In my view Trump’s proposal to block all Muslims from entering the United States and tracking all Muslims who are already there, smacks of it. It also smacks of religious persecution. Hitler was a bully. He would tolerate no opposition. Just watch Donald Trump on the campaign trail. He ridicules anyone who dares to criticize him. He appeals to baser instincts and is unable to back up many of his audacious claims with hard evidence. And worse, he doesn’t care. Of course, the rise of terrorism primarily by radical Islamists, has brought a new reality, not only to the United States but also to much of the Western world. There is no doubt that there are very bad people out there that want to change the way we live and take away our freedom as we know it. Those that bury their heads in the sand and pretend it isn’t happening, do so at their own peril. However, Donald Trump’s proposed solutions many of which in my view, border on fascist philosophy, are way over the top. Every time he opens his mouth, I believe he is actually abetting and strengthening the cause of ISIS and other terrorist organizations. More importantly, this is not who America is and it is not who the Republican Party is, as many in their leadership are finally beginning to point out. 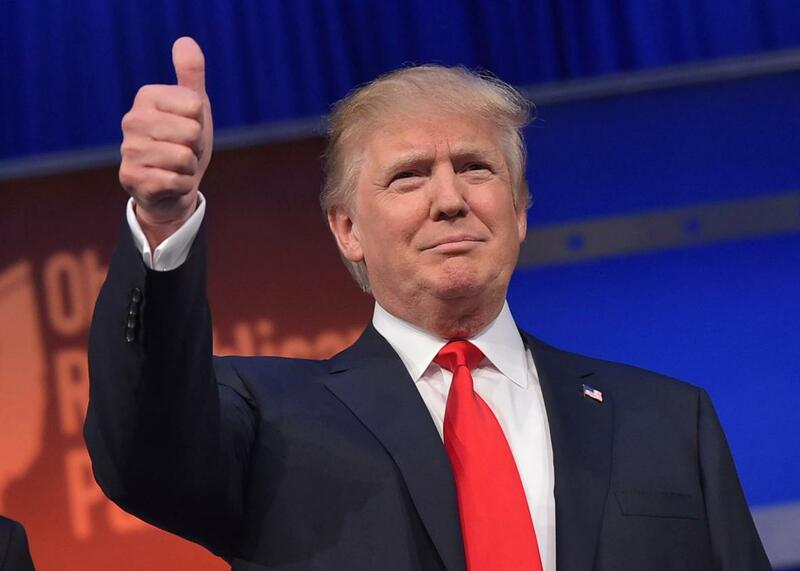 Donald Trump knows that his best chance of winning the Presidency is to do so as a Republican. Even so, hopefully he will not win the nomination as 25% support among Republican voters is currently his ceiling, although he is still way ahead of the pack. But it is time for the Republican Party to dump Trump. He is ruining their brand and hijacking their credibility, when in fact they have much to offer in the realm of public policy. Some in the Republican Party, while not supporting Trump, fear dumping him because he might run as an Independent, split the right of centre vote and deny them a chance at the Presidency. They may be correct, but in my view it is a risk worth taking to avoid many years in outer darkness. If push comes to shove, I actually doubt that Trump would run as third party candidate. He hates losing too much. There are a number of good candidates running for the Republican presidential nomination. With Trump out of the way, some of these lights will shine and the Party will have a good chance of giving the Democrat’s candidate, whoever she may be, a good run for their money next November. To keep harboring and encouraging Donald Trump however, can only end in disaster. Dump him now. It will be good for America and Canada. End of rant. I enjoy writing ‘Listen Up’ and appreciate the number of people who click on to read it, as well as the comments I receive. My opinion pieces are intended to spark debate and provide thought for fresh thinking. I write from my perspective and expect folks to respond from theirs. My column this past week attracted 24 comments. 16 of them were from the same two people, both of them friends of mine. It was like watching a tennis ball go back and forth. My neck got sore! And so friends I ask this. Please continue to comment and if someone else’s comment ticks you off, by all means reply. But let’s not turn it into a tennis match. Two or three submissions per person per week, should let you get whatever it is bugging you, out of your system and hopefully in a respectful manner. Also, if you have any suggestions of issues you would like me to address, please let me know. I would appreciate that as sometimes the well goes dry! I think Trump is right more than most of us care to admit. I agree his ego is large and his delivery a bit harsh but… is he right? People were upset and laughed at his idea to build a wall separating Mexico but as the weeks past people started to listen to his actual plan and he gained tremendous support. His latest statement to ban Muslims is just starting to gain traction over the weekend as the media and people around the world actually listen to what he really said and research the idea for themselves. I have watched the debates in there entirety, read many articles and listened to hours of interviews…. the alternatives to choose from are weak. They are not even close in the polls. I am not aware of anything the other nominees stand for? I admire Trump for putting it out there; he launches debate on difficult topics miles ahead of where it has stagnated for years. Thank you for an excellent post Hugh. I am generally very uncomfortable with comparisons to the Nazis. They are sometimes used too lightly and it inherently lessens the scope of the evil perpetrated by Hitler and the Nazis. However, Trump’s talk of religious registration and identification flirts with fascism in a very disturbing way that should be deeply repugnant to people of all political stripes. What fuels his message is fear of the ‘other’ and ignorance. People fear what they don’t understand and even more so if it has some bit of truth. I think the idea of being governed by a ‘winner’, especially when they are terrified of terrorists and fearful for their own financial well-being and security, is comforting. People feel under attack and marginalized. Yesterday, I saw this posted on FB: “White people. The only race you can legally discriminate against.” It’s almost funny except….500,000 people ‘Liked’ it! A big lie (German: Große Lüge) is a propaganda technique. The expression was coined by Adolf Hitler, when he dictated his 1925 book Mein Kampf, about the use of a lie so “colossal” that no one would believe that someone “could have the impudence to distort the truth so infamously. Trump isn’t stupid, even if he sounds like it. He has shifted from rabble-rousing the disenchanted masses to something far darker. The biggest danger to the American people isn’t an terrorist secretly plotting his destruction. It’s a celebrity businessman/showman who is ‘in their face’ very openly working to bring dishonour on everything that is good about the U.S. If voters want to legitimately tackle the terror threat, they should organize the ouster of the bizarrely coiffed hate monger standing in plain sight. With apologies Hugh , I will stick to Hockey ! Fantastic reply Dale. I whole heartedly agree, especially with your last thought. Bang on! Ditto, but I`m not a hockey fan!!!! Great post Hugh although I think the candidate to be most feared at this point is Ted Cruz. He has worked hard on the ground game, raised the second highest amount of money, next than Bush, and is only slightly less crazy than Trump. The biggest difference between Trump and Cruz is that Cruz actually stands a chance to be the nominee. Whether or not he could win a general election against Hillary is another question altogether. Very interesting piece in the Washington Post this morning by Chris Cillizza. Trump’s star is waning, only getting bumps when he next makes the next bombastic remark. He captures air time and media bandwidth with each one. What this does, though, is shift the spotlight away from the other candidates momentarily, while they consolidate their base and wait in the weeds. Trumps supporters are mostly non-voters according to the pundits, but Cruz’s supporters may actually vote. Presidential politics in the US is a marathon and there is still a long way to go but most experts agree that winning at least one of the first three primaries is crucial to make it to the finish line. It will be really telling to see how Cruz and Trump relate to each other in tomorrow night’s debate. Hugh. Your article is very well written, grammatically astute, but woefully misguided. I too have spent much time in the US, and maintain many long term friendships, with Republicans and Democrats alike. The opinions expressed in your article, while well articulated, are blindingly ill-informed. Your comparison of Trump to Hitler is pure demagoguery. And Trump’s anti muslim stand is grounded in both current fact and historical precedent. In 1952, a Democrat House passed legislation allowing a President to, by proclamation only (no requirement for congressional approval), bar entry to the US of citizens of any country, or members of any defined group. Once through the Democratic House, this legislation was approved by a Democratic Senate, and went on to be signed by a Democratic President. At the time there were concerns about communists, North Koreans, and the Vietnam crisis was on the horizon. The purpose of the new Presidential power, pre-approved by congress (house and senate) was to allow, on short notice, stop the potential of incoming enemies. The only actual use of this power was by President Carter, who, during the Iran hostage crisis, proclaimed that Iranians be barred entry to the US, and that current Iranians in the US under Visa approval report, after which between 17 and 18 thousand of them were deported. This was done in the interest of national security, as Iran had threatened the safety and sovereignty of the US. Although there was no evidence of Iranians, at the time, harming the US homeland, Carter took the step to prevent such possible harm. Now let us look at the situation today. There is abundant evidence of muslims inflicting harm in the US. Fort Hood was a muslim gunning down US military service people in the name of Allah. The Boston Marathon bombers were muslims who had been granted citizenship to the US, yet turned their back on their adoptive country, again in the name of Allah. All the bombers of the WTC were muslims who, although granted entry to the US on a visa, overstayed their term, were in the country illegally, and did their deed. The San Bernardino shootings were carried out by muslims who immigrated legally, yet now we find out they lied on their entry applications. While Carter acted on a hunch, Trump is proposing action based on proven, undisputed facts. He has said that the immigration should stop, temporarily, until a proven, secure vetting system is in place. “The bad guys have made it in, so lets stop the probability of bad guys making it in” is what he is proposing. To compare Trump wanting to improve the safety of the homeland to Hitler is simple hyperbole. Trump has not suggested we gather muslims up and gas them. He has simply stated they should stay home, until they can, without doubt, demonstrate that they are not a threat to the US. There’s a big difference between Hitler’s final solution, and Trumps temporary one. Hitler didn’t give anyone a choice of staying put. Trump is. It is not the right of citizens of the world to immigrate to the US. It is a privilege bestowed by the US upon those deemed worthy. The rights of the US citizens come well ahead of those of other countries. And if there is a chance that an immigrant MAY compromise those rights (Boston Marathon, Fort Hood, WTC, San Bernardino), than the Commander In Chief better do his sworn duty, and protect the citizenry, regardless of the probabilities. There was a period in the US when ALL immigration was halted, from and and all countries. This period was for 24 (yes, twenty four) years. Before we Canadians jump on any US candidate, it would behoove us to gather some history and perspective. So what if Trump is a bully. If he gets the job done (protect the US, and its constitution), who cares if he’s a bully. Sometimes it takes a bully to get the job done a pussycat won’t. Any immigrant to the US seeking refugee status MUST, by law, state a religion. There is already a religious test for immigrants, and it is law. Stop harping that enforcing the law is fascist or otherwise. It has been a test in the US for decades. It is not new. Paul – while I admit crazy in this context is mostly in the eye of the beholder Mr. Cruz’s public statements certainly lean to the outrageous and bombastic side to me – much like Trump. Numerous American news feeds and political websites are regularly commenting and documenting on the litany of falsehoods and exaggerations that has become a steady stream from Mr. Cruz. Politifacts.com, for example, lists a full 78% of his commentary ranges from half truths to outright lies (mostly false 29%, completely false 32%, pants on fire 5%), but that doesn’t stop him, in fact he just turns up the volume. Ana Maria Cox of the Daily Beast writes an excellent article entitled “The Truth Behind Ted Cruz’s Lies”. His abrasive temperament , attacking fellow Senators, being instrumental in the last government shutdown has even Donald himself commenting on his ability to lead. HIs views on climate change certainly, for this writer, sound crazy to me! So Paul, while I am certainly not a physician who could officially diagnose another’s ‘craziness’, when I listen to Ted Cruz, it’s a word that immediately springs to my mind – call me crazy! Tim. Thanks so much for your reply. I appreciate it. What concerns me is not that you cite sources, but the sources that you cite. Both Politifacts and the Beast are notoriously left wing publications, whose mission is to discredit any candidate that poses a serious threat to the potential Democratic nominee (Hillary). Please understand that I admire your reply, and that you have done your best to inform yourself, but I encourage you broaden the sources on your horizon. I am not going to suggest alternative sources, but perhaps if you went to far right sources, you may wind up with an opinion that is somewhat balanced. For me, I choose not to go to a source, but listen to the candidates directly (debates and otherwise). This way, I need not rely on a journalists’ opinion or agenda, but I can listen to the candidate and form my own opinion. It is this writers firm opinion, that if you were to listen to Cruz directly, and not the opinion of those that have listened to Cruz, you would likely dial back your diagnosis of crazy. While I am neither a physical nor a psychologist, what I hear, directly from Cruz, sounds like sound policy, sound logic and reason, and would not mind if he were in charge of my federal government. One of the advantages Trump has at this time, is that he is self financing.This is something that most politicians do not have resume. We know about the power of the N.R.A. The Kock Brothers. Various unions. He can stand up and say I am not beholding to anyone but those who elect me. That is pretty powerful. Karen – had you watched the debate Tuesday evening, you would not have made your comment. Trump stated, unequivocally, that he would support he Republican Candidate if it were not him. I agree that a third party candidate emerging from the Republican primary would split the vote, but your contention of it being Trump based on his ego, is erroneous. Although the USA is a developed country, it has a constitution that, if honored, would steadfastly keep it from “progressing toward the humaneness other developed countries take for granted, …”. While you may be comfortable with socialism, much of the US is not, and remains unwilling to accept it. The average American wants to pay for their own health care, not their neighbors. The true silver lining is that a true conservative may be nominated, and may go on to abate the tide of socialism that Obama and Hillary have begun and wish to continue. Frankly, Paul, if my neighbour is sick while I am healthy, I don’t mind paying for his health care. At some point, he will pay for mine. That’s the whole concept — we take care of each other in times of need. It’s basically an institutionalization of a community imperative. This is why it’s political suicide for a Canadian politician to propose getting rid of it — and will be in the USA too, eventually, when they realize how much the benefit outweighs the supposed dangers. Answer the truth: would you give up the health care system we have in Canada? Please cite the part of the American constitution that prohibits humaneness, socialism or public health care. Re Trump — I might be wrong, but saying and doing are two very different things. It’ll be interesting to see what happens. Karen. I appreciate your reply. As to your direct question, yes, I certainly would forgo my Canadian health care (more specifically, OHIP in Ontario). An open market for health services and insurance would rid the public system of it’s absurd inefficiencies. We would all benefit from lower costs and improved service. I am sure you shop around for your auto and home insurance, and balance and shop for the best rates for coverage/deductible/extras. Wouldn’t it be nice to similarly shop your health care? Evidence in favor of this position is not available in Canada, as public health care has been entrenched for so long, one can observe it in reverse in the US. Since the inception of the Affordable Care Act (commonly referred to as ObamaCare), insurance rates are up 40%, the doctor pool is shrinking (earlier retirement and med-school/pre-med students switching majors), the enrollment of the “uninsured” is less than 1/3 of projections, and the government financial support of the ACA is about to run it’s 3 year course, after which the entire system will collapse, unless there is a bailout (likely) similar to those of the auto companies (not Ford) and the banks. When the government meddles is a functioning market, typically there are downsides, as seen in the US. In Canada, we just accept these inefficiencies as the norm. Freeing the health care industry of government oversight would allow the marketplace to convert these inefficiencies to reduced costs and improved services and greater supply of services. But Karen, you are dead correct. No Canadian politician would dare propose unravelling public health care. It would be suicide for his/her career, although a successful implementation of such a plan would benefit us all. As for the US constitution, it is absurd to ask about a provision therein prohibiting humaneness. It’s cute rhetoric on your part, but we all know that no such provisions exist in the US constitution, or the charters or constitutions of any other country. As for socialism, the entire constitution guards against this. Private property rights pop to mind when discussing socialism, and these are firmly entrenched in the USC, and you know well that socialism is not too big on private property rights. That, on its own, answers your question. As for seeing what Trump will do, yes, it’ll be interesting. Thank you for the hearty debate Karen. “Want(ing) to change the way we live and take away our freedom as we know it” is Americanpresidentspeak for “We need an external threat to justify trampling another country and seizing their oil”. What they want is to take away the American government’s freedom to to send drones into their countries and blow up 10 innocent men, women, and children or more for every perceived terrorist that they actually succeed in murdering. How can this not incite ever-greater hatred toward the US to the point of committing acts of desperation to try to put an end to the genocide? And anyone who still believes that the events of 9/11 were masterminded by 19 Muslims armed with boxcutters must still be cowering under the slab of premium Ontario quarried granite that he or she crawled under on that horrific day. I don’t usually read fiction, but when I do, I read the Final report of the Nation Commission on Terrorist Attacks On the United States. I spotted the first of very many inconsistencies that defied the official narrative, to say nothing of the laws of physics, such as the way the airplane slid effortlessly into the side of the building as if it were passing through a waterfall. From there it just got “curiouser and curiouser”. Substantiation is there, by the truckload, to be considered or ignored. I do not judge others for the choice they make. I dared to break from my spoon-fed comfort zone and consider the facts independently of the controlled media, and have no intention of looking back.